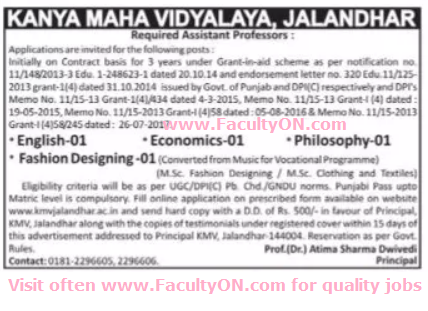 Kanya Maha Vidyalaya, Jalandhar has advertised in the TRIBUNE newspaper for the recruitment of Assistant Professor jobs vacancies. Interested and eligible job aspirants are requested to apply within 15 days from 11th July 2018. Check out further more details below. College Profile: Kanya Maha Vidyalaya, the pioneer institution of women education, has long been recognized as a premier centre of higher learning for women in North India. Accredited A+ by NAAC (National Assessment and Accreditation Council, Bangalore), the college strives ceaselessly to emancipate, enlighten and empower women. Education at K.M.V. is a unique amalgam of traditional learning and futuristic vision. Qualifications: As per UGC / DPI (C) Pb. Chandigarh / GNDU norms. How to Apply: Interested and eligible candidates are requested to send application in prescribed format downloaded from college website along with CV, copies of certificates and recent PP size photo and application fee DD to the following postal address.